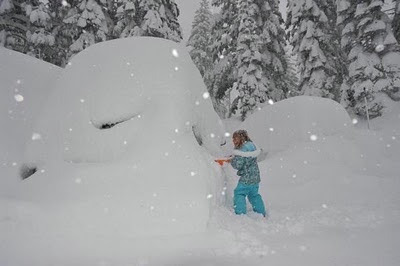 The above image is a girl, this week, trying to dig out her car at Mammoth, with what appears to be an ice scraper. A good friend sent me this image and it gives you an idea of just how much snow has fallen in the Sierra. 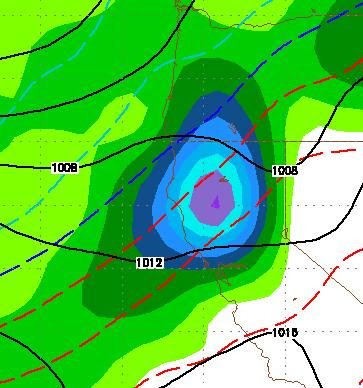 This picture could play out anywhere from the Central to Northern Sierra as snow could be measured accurately in yards! 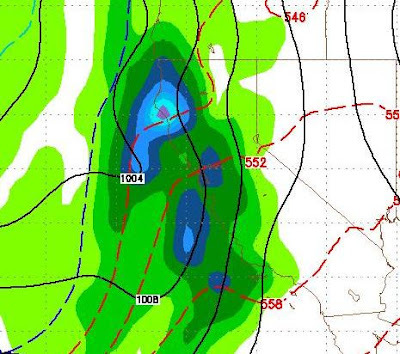 This storm will dump more snow in the Tahoe Sierra starting late on Christmas day and lasting through December 26th. 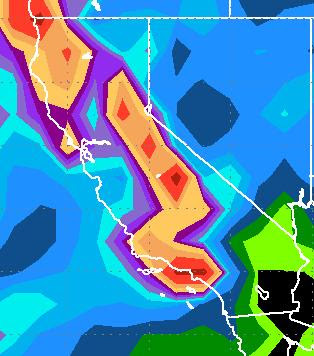 The models are still all over the place as to exactly the area of the Sierra that gets hit the hardest. The potential for flooding is very real, as this is a very warm storm. Estimates are ranging from 7,000 - 8,000 feet as the snow level. I believe 7,000 is pretty accurate for the Tahoe area. 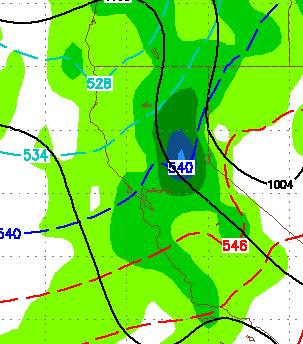 I am also sticking with yesterday's post that the brunt of the storm will hit in the Central Sierra just to the south of Lake Tahoe. The folks in Mammoth should brace for an amazing week of weather starting tomorrow. That is not to say that Tahoe is off the hook. Right now I believe the bulls eye is just south. 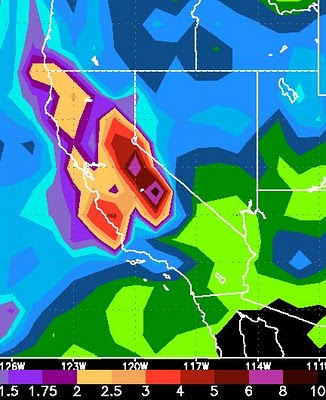 The Tahoe Sierra is going to see a tremendous amount of snow. Check yesterday's post to get an idea of how much and when. Mt. Rose picked up close to 2 feet of fresh snow on Tuesday. If you think that was good wait until this weekend. All the elements are coming together for a dump that should last from Friday through Tuesday and could bring as much as .... dare I say it?? ... 6-14 additional feet of snow over the Sierra Crest. Big Changes On The Way, Starting Tonight, Lasting Through Christmas?? There are major changes on the way, starting with a weak storm coming through the area tonight and hitting the Sierra with decent snowfall all day tomorrow. Expect 1-2 feet of snow over the Sierra Crest and 6-12 inches of fresh snow at Mt. Rose by Wednesday. The winds will really start to kick up tonight. 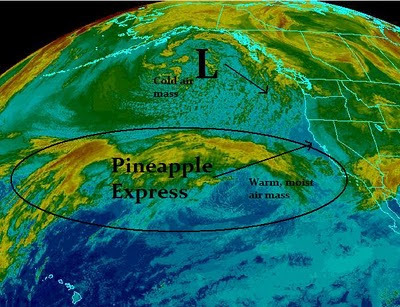 The Jet Stream remains well north of Tahoe which means mild weather with minor interruptions when smaller, weaker storms come through the Lake Tahoe area and leave 6-12 inches of snow behind, followed by more mild weather. That will continue with snow above 7,500 feet today and tonight, then mild Thursday followed by another short wave Friday. I played 9 holes of golf late yesterday afternoon, in shorts pants and short sleeves. Today, with early release, Scott and I will head up the mountain and tear it up for a few hours. A large, warm ridge of high pressure moves in for this weekend through the beginning of next week. That will bring above average temperatures to the entire region with highs in the 50's in the mountains and 60's in the valleys. We may even be able to squeak out a 70 if we are lucky. Look for the slide side parking lot to be filled with tailgaters this weekend. 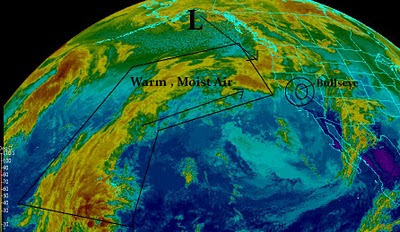 Warm, Wet Storm Coming Our Way ... Storms Start Up Again In 10 Days? 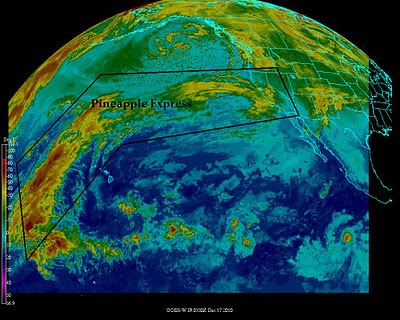 The weather models are in alignment. A fairly weak, warm, moist air mass will move into the Tahoe Basin over the next several days and drop around a foot of snow above 7500 feet. Looking forward, the warm air will stay in our area for at least another week. Remember as the PNA goes negative, our storms increase!